Save Water At Home: Start Today! KOTA KINABALU: Talks of green living and eating healthy food are becoming hot topics among people, especially health and figure conscious individuals. Many are opting for sustainable farmed organic food, and lean meat instead of pesticide contaminated vegetables or hormone injected farm animals for their daily dietary supplement. 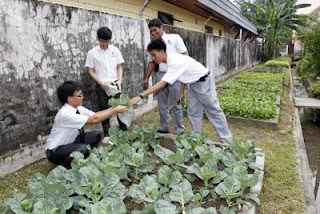 Realising the importance of cleaner food, air and environment, one teacher, Wong Foo, from the All Saints Secondary School near here have set up a horticulture club to promote sustainable farming. The physics teacher came up with an idea of changing the school’s landscape into a “gardenscape” concept early April last year, and gathered several pioneer members to assist him. “The students and I started off small, and planted vegetables at a small piece of land behind the school without using pesticides or chemical fertilizers,” he said during the launch of the horticulture club last week. “It was hard at first because resources were limited and our manpower was small, but after a few months, our first few patches of vegetables grew magnificently and I decided to expand this initiative by starting a club (unofficially) in January this year,” Wong said. Since then, over 40 students from the Forms 4 and 5 Science classes have worked hand in hand to plant more vegetables in the school compound, with an accumulated plantation area reaching about half an acre now. 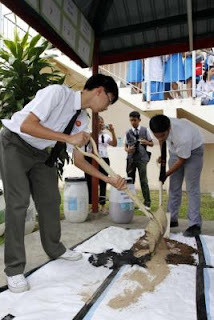 This effort had also attracted the Sabah Environmental Protection Association (SEPA) and the Environment Action Commission (EAC) to help the club members and school in their sustainable farming programmes. In this respect, club president Ricky Wong said the sustainable farming in the school was made possible because of the support from students and teachers. “We started with the preparatory stage, then maintaining the vegetable patch so they would grow well for harvesting, and lastly to be sold among school teachers and parents,” he explained. Ricky said the teachers have also shown support by advising them on how to go about the project and bought the vegetables when they were ready for harvest. He said fertilizers were self-made using carbon, rice bran, chicken dung and molasses. “The process to make these fertilizers take about two weeks, whereas vegetables which are planted on rotation basis take about one to three months to grow, depending on the type of vegetables,” he said. The types of vegetables planted include spinach, Chinese cabbage or bak choi, yam, bittergourd and baby kailan. Wong said they also plant flowers around the vegetables so that insects and other pests would nibble on the flowers instead of the vegetables to keep them fresh and edible. Meanwhile, Tourism, Culture and Environment Ministry permanent secretary, Datuk Michael Emban who represented the minister, Datuk Masidi Manjun hopes the programme continues and spreads on to other schools. “This is an area which the ministry is responsible, so we will definitely support these initiatives with the hope that other schools will emulate,” he said. bagus juga idea ni.. nampak hijau juga kawasan sekitar sekolah..
saya rasa semua sekolah juga perlu melaksanakan idea ini di sekolah masing2.. selain menghijaukan kawasan sekolah, aktiviti ini juga mampu memberikan banyak pengetahuan dan kemahiran kepada pelajar secara praktikal berkenaan dengan pertanian. malah, hasil tanaman juga mungkin boleh dijual oleh pelajar2 yang berminat dengan bidang perniagaan.. Sustainable farming must be practiced by all in order to protect the environment. Good job to the All Saints School students on their efforts in sustainable farming. Keep up the good work and hope that this will influence other schools to start their own mini farm. Great to see these students being interested in agriculture.